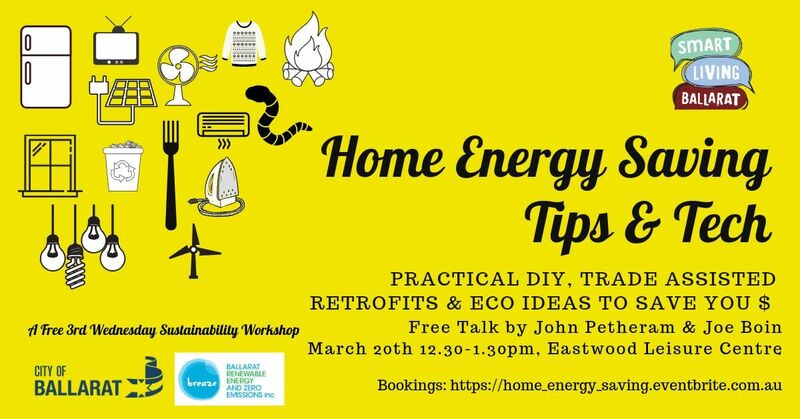 Home Energy Saving Tips & Tech is a free one hour sustainability workshop brought to you by Smart Living Ballarat in association with Breaze Inc. and the City of Ballarat. It is part of our monthly 3rd Wednesday Free Sustainability Workshop series. This session will focus on home energy efficiency and look at ways to assess your unwanted energy losses and gains. It is designed to help you reduce the burden of rising utility costs, addresses the need for us all to be reducing our carbon footprint and allows you greater comfort in your own home over hotter and cooler months. Presented by long time Breaze Inc. members and Smart Living Ballarat volunteers, Joe Boin and John Petheram, this workshop will provide hands-on demos and practical do-it-yourself materials and retrofitting solutions for you take away and apply in your own home, or with the assistance from applicable trades. Some of the issues will also be applicable to people who rent, so you don't have to own your own home to get the benefits of some of the simple and cost effective ways you can save energy suggested in this workshop. There will also be an opportunity to see pictures taken from an Infrared camera observing directly the massive heat losses in winter through windows, uninsulated floors and ceilings and gaps in walls.